This article discusses the history of dolls, noting their multiple uses (from religion to fashion) and their spread across the world. It originally appeared in the December 1942 issue of American Collector magazine, a publication which ran from 1933-1948 and served antique collectors and dealers. In a New England parlor of the 1890s a doll of the period was perched on top of a high book case, well out of the reach of grimy childish hands. From the top of its flaxen head to its neatly slippered feet it was a most lifelike representation in miniature of a young girl. Illustration I: Rare 18th Century Wooden Dolls: These are typical of the dolls imported to America from England and Europe in Colonial days. Dolls of this period all portray the adult figure. The Parian ware head with delicately tinted face, slightly parted lips showing several perfectly shaped teeth, blue eyes that opened and shut, was crowned with a wig of blond hair that was cut in a bang across the forehead and then fell in long ringlets to the shoulder. The kid body, so jointed that the little figure could be placed in either a standing or sitting pose, was clothed in the cream of late Victorian stuffiness, including seven petticoats of lace and nainsook and a dress of pink silk heavily overlaid with lace. On a shelf in a curio cabinet in this same room stood another little figure, not over six or eight inches high. It was a wooden doll, straight and stiff, with arms and legs that moved not at all. Made about the year Queen Victoria ascended the throne, its little painted face and style of hair dress much resembled that of the young queen, while the low cut green silk dress and other costume details indicated the styles of the late 1830s when the little girl who once owned the doll lived. These two dolls, one representing the beginning, the other the end of an era, are fair examples of the appeal such toys have for collectors today. In miniature they portray the human form in three dimensions and they mirror the customs and costumes of various periods. In a sense the story of the doll is the story of civilization, since it probably is the oldest of toys. Dolls of clay, wood, and wax have been found in the tombs of the Pharoahs in Egypt, put there with other homey items for the pleasure of the human soul in its journey into the hereafter. Among primitive peoples the doll was probably not a toy but was used for religious purposes, both benign and sinister. An example of the latter was the practice of making a diminutive wax image of one’s favorite enemy and sticking it liberally with thorns or pins in the belief that a painful and fatal illness would result for the victim. This form of voodism has come down through the ages and furnished the plot for many an exciting short story in these later days. Illustration II: Doll with Composition Head: Made by Ludwig Greiner who produced these dolls from 1858 to 1878. This example with full skirted flowered dress portrays the styles of the mid-19th Century. During the Middle Ages in Europe the doll was used to depict religious events, chief among these being Nativity scenes. Known as creche dolls, the Holy Family, the Wise Men, shepherds and others were represented in costumes of the period in which the figures were made. For adults and children alike this dramatic telling of the story of Christmas in both cathedral and home was often more realistic and compelling than words. 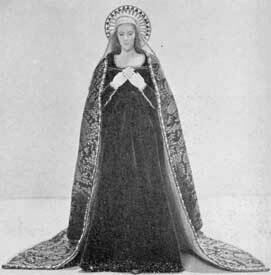 From showing Biblical characters in modern dress, it was but a step to making the doll into what was known as a “fashion baby.” In a day when magazines showing the latest styles in dress were not to be purchased at the corner news store, dolls made and clothed in modes of the moment were in circulation from the 15th Century on. When such dolls had served their purpose, they were often sold as toys for children. 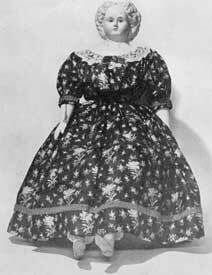 In fact, save for these and other European dolls bought as presents by indulgent friends and parents, the early American child played with home-made dolls. These might be crudely fashioned from wood, from cloth, or even corn husks. The earliest European doll was brought to this country in 1607 and given to a little Indian child in Virginia. Tradition has it that the donor was Captain John Smith. Certainly he had a way with the Indians and such little attentions may have been one of the reasons. Illustration III: A Madonna by Mrs. Heiser: Here the artistic beauty of a modern portrait doll is shown. Later examples include one brought from England in 1699 by William Penn as a gift to a friend of his little daughter; one from France in 1724 by way of Canton, China, since the donor was a Salem sea captain; and one brought to a young member of the van Rensselaer family of New York in the mid 18th Century. These and similar dolls were of wood, made to order and correspondingly expensive. Glass eyes were inserted in the wood; a wig of hair surmounted the wooden head which was made more lifelike by a coating of plaster over which features were painted. 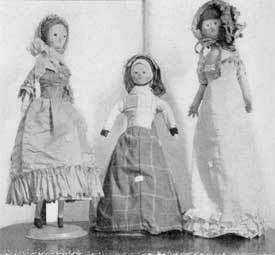 The three dolls shown here (Illustration I) were imported from England early in the 18th Century and are quite sophisticated with their inset glass eyes, real hair and enameled features. Included in the manikin and specially made dolls of the 18th Century were those with head and arms of wax and body of wood, cloth, or kid. They were to be brought to a high state of realism in the mid 19th Century by Madame Montanari, life-like features and hair embedded in the wax to simulate natural growth being among the details. But wax was at best a perishable medium and the comparatively few early dolls that have survived were probably not played with over much by their young owners. Besides they were also expensive, so the doll carried about by day and tucked under the pillow by night was probably the home-made rag doll or its equivalent. 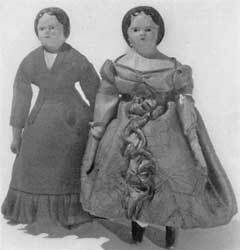 By the turn of the 19th Century dolls were being made for commercial profit on the Continent and in England. America lagged behind and though records show that manufacture of toys began in the United States as early as 1835, there is no reference to dolls. Illustration IV: The Spirit of '76: A doll group copied from the famous painting of that name, by Avis Lee, maker of historic American dolls. However, on March 30, 1858, Ludwig Greiner, listed in Philadelphia in 1840 as a “Toy Man,” took out a patent for an “improved” doll’s head. This head was of composition, an outgrowth of the papier-mâché ones which originated in Sonnenberg, Germany, about 1810 and revolutionized the doll industry. His improvement was described as “strengthening the seams and projecting or exposed parts of doll heads by cementing or pasting on those parts muslin, linen, silk or other equivalent material.” This was of course put on the inside of the head and today serves to identify the work of this maker. In addition these heads carry two labels, one with the date, 1858, and one with the patent extension date, 1872. They are further distinguished by their beauty of feature and coloring (Illustration II). Heads of leather were also made in this country, especially at Bristol, Connecticut, during Civil War days and for about a decade thereafter. 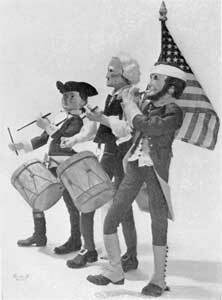 Two distinctly American types of dolls appeared during these years, however. One was the rubber doll, made by Benjamin F. Lee of New York City from about 1850 to 1870; and the jointed wooden doll of Joel Ellis and other Vermont makers. Most desirable with the former is a portrait doll of Jenny Lind, who was immortalized in toys, textiles, glass and other media during her tour here in 1850. The Ellis wooden dolls were products of the 1870s and were of maple, a local and abundant material, and were so ingeniously jointed as to arms and legs that the figure could assume all sorts of lifelike positions. Feet and hands were of lead and sometimes pewter. Such dolls were often cherished quite above the more aristocratic members of a small girl’s family, since Susy, in addition to her acrobatic stunts could also write her own name — with a little guidance. Illustration V: Imported Doll Heads of the 19th Century: From left to right the materials used are, Meissen, Parian ware, china, Parian, china, bisque, and china. The fifth head depicts the Empress Eugenie; the seventh, Jenny Lind. But despite these evidences of American enterprise, dolls and doll heads particularly, continued to be imported from Europe and to be regarded with higher favor by American clients. So toy makers here found it more profitable to produce doll bodies of kid, cloth and the like and attach imported heads to them (Illustration V). These heads were made of Parian ware, china, papier-mâché, and composition. Some were very beautiful; many were portraits of famous people, such as the Jenny Lind doll head at the extreme right. Dolls with mechanical devices, such as eyes that opened and shut, were made as early as 1824. From these human ingenuity went on to those that squeaked when pinched, and walking dolls (Illustration VI). After that came the deluge. But now the pendulum swings back and of late years there has sprung up in America several makers of dolls who have true artistic ability and again show the doll as a mirror of mankind. One of these, Avis Lee, depicts historical events (Illustration IV) and other Americana. Her group, “Spirit of ’76,” has an advantage for the school child over the excellent painting from which it was copied, because it is in the form of actual figures that can be touched and handled. Illustration VI: Two Walking Dolls: Here costume and style of hair dress proclaim the era in which these two little figures were made. The genius of Mrs. Heiser, on the other hand, lies in portrait dolls (Illustration III). Whether a madonna or a secular subject, her rendering has a beauty and realism that makes a collector want at least one to round out a collection. Thank you for posting this article, I have been searching for this particular one for a few years! “ ” I really doubt that Steve McQueen would have copped to the notion of being a collector.